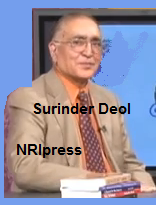 NRI author Surinder Deol talks about his lifelong affair with Mirza Ghalib. Surinder Deol first novel, “Endless Life”, a poetry collection “A Moment In The Universe”; “The Summit”, a spiritual fable; and “Japji: The Path of Devotional Meditation”, a Guru Nanak’s teachings. And fifth book, “The Treasure. Ghalib’s poetry is like red wine that he cherished so much. You start this work and you get intoxicated and you can’t leave it. Words are prayerfully complaining About whose playful writing? Beautiful images are seen Wrapped in paper clothing This is the opening couplet of Ghalib’s divan, and it captures his view of the badly broken world in which he lived and God’s indifference to human condition. The poet faces God and poses a question: Why did you create this universe? What was the purpose? If this is your creation, why do we have so much misery and suffering? Was this creation an act of playfulness, or did it have a nobler purpose? People praying and pleading in front of the Creator with paper clothing covering their naked bodies is symbolic of their complete helplessness. In many ways, this sets the stage for Ghalib’s struggle to make sense of reality and find a new rationale for our relationship with God. Surinder Deol said Ghalib became popular because one can find expressions of innovative thoughts full of metaphors and similes, and also a wide range of topics and subjects in his poetry. Ghalib came into the life of India-born author at “an early age, thanks to my father” who gave him two classics – Shakespeare and Ghalib’s works – when he was still in high school. Endless Life: Clad in a decorative red sari, Malti, a dreamer and a somewhat spoiled daughter of a wealthy Indian family, sat with Rakesh, an Indian physician living and working in New York, on the ground in front of a sacred fire. “We are asking you to sit on the ground,” the priest explained, “because you’re forging a new connection to live the rest of your lives as a husband and wife. The mother earth is going to be a witness to this union. I want you to feel strong, drawing energy from the center of the earth. You will always need this strength because life brings new challenges every day.” This marriage brought Malti to New York but the love she dreamed of eluded her. The passage of time brought new challenges and a heart wrenching loss. Malti moves back to India in search of someone who could unlock the mystery that was causing her immense distress. She accomplishes this mission with help from Harish, a newly minted real estate billionaire, whose love for Malti went back to their time together in college. Malti realizes her dream of having the unconditional love of a man on a New Year Eve at a sea-side mansion in Goa. She remembers the words that her grandmother had once spoken to her. “It will take a long time for you to get there, but the day you arrive, you will have become the person you always wanted to be.”Endless Life portrays a woman’s search for love and meaning in an increasingly complex world. “Life is a flow; it’s a continuum. Nothing really goes away. We continue to live despite all the hardships and tragedies. We plan new things, always expecting to see better days in the future. We never stop dreaming.” It is this act of not stopping to dream that makes life ENDLESS. • JAPJI is a seminal spiritual composition of Guru Nanak, the founder of Sikh religion, that charts a new path for defining our relationship with our Creator and how we could find fulfillment in life. . The print edition has been a best selling book on Guru Nanak’s teachings for the past 14 years. An Indian-American author of a new novel inspired by 9/11 wants Indian writers returning their literary awards to protest intolerance to instead change the national mood by telling great stories aimed at challenging divisive forces that want the country to be “mired in the hatreds of the past”. : India-born author Surinder Deol has penned a new English translation of Mirza Ghalib’s works to bring the famous Urdu poet to North Americans as also those South Asians who have lost touch with their native languages. “That is a very large audience. And if I succeed in getting their attention, then my job is done. But I also feel that my book is useful for South Asian readers too,” Deol told IANS in an interview. Published by Penguin-Random House imprint Partridge, Deol’s 378 page free verse translation of Ghalib’s entire Urdu divan titled “The Treasure: A Modern Rendition of Ghalib’s Lyrical Love Poetry” was released here last week. “The younger generation of Indians in the US and other foreign countries who do not read Urdu or Hindi scripts or can’t speak the language can now enjoy India’s most loved poet in a language that they speak every day,” he said. “Since I was very impressed with Coleman Barks’ free verse rendering of Rumi, I thought of using the same technique for Ghalib. “But you know Ghalib’s poetry is like red wine that he cherished so much. You start this work and you get intoxicated and you can’t leave it.” Deol said. “The task got harder as I proceeded but by then I had become an addict. “A book like this takes much longer to find acceptance but I’m very hopeful that my rendition of Ghalib will one day become a popular text for ordinary readers as well as for students of oriental literature,” Deol said.